A Florida man attacked his pregnant sister and bit a police officer because someone touched one of his cigars. 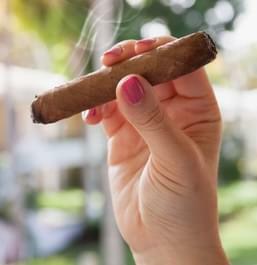 The man thought his sister’s boyfriend had either moved or smoked one of the cigars. He pushed his sister and other relatives as they tried to calm him down. The guy also threw ketchup, a half-gallon of juice, and other containers at his sister during the argument. He also attempted to knock the refrigerator over on top of his relatives. When police arrived, the guy bit an officer’s left thumb and threatened to kill him. The 23-year-old guy was arrested. According to jail records, this guy’s been arrested six previous times & had been sent to prison twice.